The Yoga Kitchen celebrates nourishing wholefoods. These recipes enable you to reclaim your inherent power to heal your digestive system and boost immunity. This book will inspire you to return to the kitchen to create delicious simple, satisfying and nutritious meals that will appeal to the whole family. All the recipes are gluten, grain and dairy free, and based on the ‘Food Combining’ principles that promote good digestion and nutrient absorption, weight loss and an alkaline body. 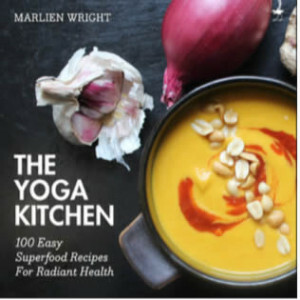 Marlien’s Yoga Kitchen journey began when she started hosting and blogging about her ‘yoga retreat food’ and ‘yoga farm lifestyle’. She lived and travelled abroad, where she felt inspired to recreate healthier versions in her own kitchen.